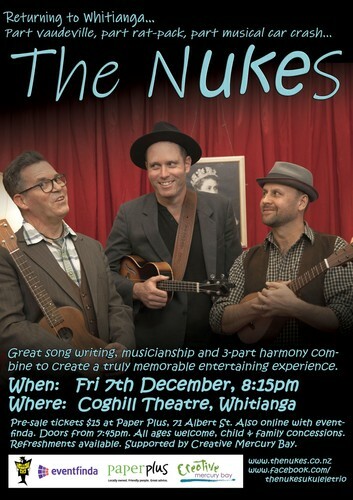 The Nukes from West Auckland are far more than a ukulele band. Part vaudeville, part rat-pack, part musical car crash, this talented trio deliver an engaging mix of humour and originality that audiences of all ages will love. The innocent little uke is the instrument of choice and people will be staggered by what the Nukes are able to achieve with it. Great song-writing, musicianship and 3-part harmony combine to create a truly memorable, entertaining experience. Aotearoa’s favourite original ukulele trio began life in a humble but spectacular fashion way back in the heady days of 2008. Founded by Dave Parker, Ben Collier and Dave ‘Snapper’ Thiele, The Nukes promptly set about carving themselves a cozy niche in the cutthroat world of the New Zealand ukulele scene. Many roads have been travelled in the decade since, many songs have been sung and many challenges overcome. It’s the new Nukes. Do try it.